Not all garden and landscaping outfits provide services that truly ensure the safety, satisfaction, and convenience of their clients. At Springfield Gardens, Lawns & Landscaping, you can trust that we have your best interests at heart. Even when the weather turns bad and you are stuck at home, you can count on us to create a path for you—literally. We remove snow and ice from your lawns, walkways, driveways, and garages so that you can come and go with ease. Snow removal is considered a priority work. At any time during the winter months, you may experience being in need of snow removal services so it is best that you have one when you need one. Springfield Gardens, Lawn & Landscape offer a complete line up of regular snow removal services, including snow plowing, shoveling, sidewalk clearing operations, salting, and removing ice. 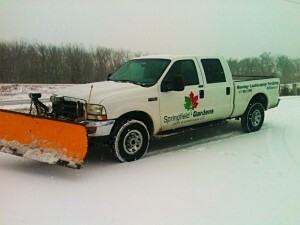 You can call our hotline numbers 24/7 if you should ever find yourself in quick need of snow removal. Whether you are at home or in your office, we will try to get to you as soon as possible so that you will not have to worry about encountering an unwanted accident or damaging your vehicle as you try to maneuver out of your snow-packed driveway. We can also drop in on your car lot, retail store, or shopping center to provide assistance when and where necessary. This means that we will literally pave the way for you wherever you are! Why entrust your safety to some other company that does not have the courtesy, experience or skill to deal with bad weather conditions like we do? Our staff will be happy to assist you in your time of need. They are polite, professional, and able to think on their feet to help you get from one place to another on time. Our services are competitive, reliable, and efficient, so you won’t ever have to be late for your flight, dinner or meeting even when a snow storm is raging outside. To top it all off, we have a complete array of weather proofed equipment and trucks to deal with the snow drifts and banks. Our fleet of commercial-grade plows, pushers and skid steers guarantees that we can clear your lots up to the very last inch of snow. Rest assured that we will keep doing our job even during the worst weather conditions, to ensure you and your loved ones’ safety at all times. Now you will not have to worry about being stuck anywhere during an unexpected snowstorm. We will get you out of there and back on the road as soon as possible. Call us now at (417) 882-7800 is you have any specific queries. Our staff will surely be more than happy to assist you.